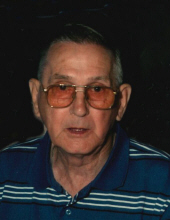 James Harold Gaylor, 90, passed away Thursday, March 14th, 2019 at his residence. He was the widower of Alma Jean Miracle Gaylor who preceded him in death on June 26, 2018. Born December 11, 1928, the son of the late William and Lucy VanWinkle Gaylor. He was a veteran of the United States Army having served during the Korean War. He was a career grave digger who took pride in his workmanship. He was a child of GOD who faithfully worshipped at Friendship Baptist Church where he was a member. James loved storytelling, horses and especially his personal horse, Ace. He enjoyed watching wrestling, old western movies and travelling and sightseeing. He truly loved the LORD, his family, his fellowman and his country. Visitation will be held after 5 PM on Saturday, March 16th at Friendship Baptist Church on Hwy. 1781, Crab Orchard, Kentucky. Memorial contributions can be made to Liberty Baptist Church Cemetery Fund. To send flowers or a remembrance gift to the family of James H. Gaylor, please visit our Tribute Store. "Email Address" would like to share the life celebration of James H. Gaylor. Click on the "link" to go to share a favorite memory or leave a condolence message for the family.